All software goes through development stages, and Grand Theft Auto: Vice City is no exception. This article lists all content cut from the final release of the game; planned content that did not make it into the final game and content that is in the final game but has been made inaccessible. This content ranges from deleted vehicles and player skins to the removal of entire characters and mission strands. Information about this content can only be inferred from game files, pre-release screenshots, videos, previews and interviews with Rockstar's producers. SWAT members wearing a different styled outfit. Tommy Vercetti wore a dark blue Hawaiian shirt . Ricardo Diaz' concept name was supposedly Fernando Diaz. Pastor Richards was rumoured to have given protagonist Tommy Vercetti a mission. Kent Paul originally had a totally different model according to unused files. Cam Jones' concept name was possibly Mike Jones. On Kent Paul's website, BJ Smith's concept name was possibly BJ Jones. According to files found on the PS2 disc, there is a reference to Trashmaster missions, indicating that trash collecting missions was initially for Vice City but got delayed until GTA Liberty City Stories. It would have been similar to the LCS rendition, by having to pick up garbage containers and deliver them to Vice City Junkyard. A pedestrian with blond hair, pigtails, and a red skirt used to be in the game. Based on her appearance in "The Party" with Jezz Torrent, it is implied that the pedestrian was replaced by the brunette Love Fist fan. Unused audio files suggest that Dwaine and Jethro were to make an appearance in "The Fastest Boat" for Ricardo Diaz. The coke on Sonny Forelli's table during An Old Friend was blocky instead of round. A map for Sunshine Autos' Vice Street Racer depicting the city in its pre-release design. The northeast part of the Vice Point's beach did not exist. Outside Bunch of Tools in Washington Beach. Outside Screw This in Little Havana. Outside The Malibu Club in Vice Point. Outside The V-Rock Recording Studio in Downtown. Outside Washington Beach Police Station. Outside Sunshine Autos in Little Havana. The Exploder billboard on the Deli across from the Little Havana police station used to be a different, smaller one. Apartment 3c used to be visible from the outside. 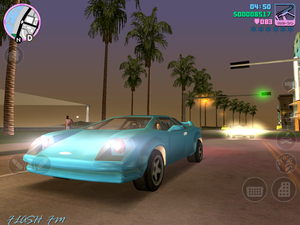 Its HUD icon is reused in the mobile versions of GTA Vice City, albeit recolored blue and pink. The Rocket Launcher from GTA III was originally in the game. The original front and back designs of the Infernus. The Infernus had thin rectangles for its headlights and taillights and had larger spoilers, and was probably named the Inferno. There is an unused car model is left in the game named "Inferno" that is based on early pre-release screenshots of the Infernus, implying that the Infernus used to be called the Inferno. It also more closely resembled a Lamborghini Countach. Tires were able to be slashed and recorded into the stats. A Coastguard Maverick was supposed to have appeared in GTA Vice City, however, it was cut during development. Remnants of the Coastguard Maverick include an entry in the handling file (COASTMAV) and an entry in the text file (COASTMA). Nothing else is left of this vehicle and based on those two pieces of evidence, the vehicle is most likely a helicopter used by the Coastguard. The Virgo had a different look and was probably named the Cougar. There is an unused car model is left in the game named "Cougar" that is based on early pre-release screenshots of the Virgo, implying that the Virgo used to be called the Cougar. It also more closely resembled a Mercury Cougar. Likewise, the Mesa Grande might have been named the "Desperado"
The Blista Compact originally looked almost identical to the Honda CRX and featured the letters "GPX" on the back. The Moonbeam was originally, implied, to have sliding rear doors. This made it more closely resemble a Chevrolet Astro. The Phoenix more closely resembled a Pontiac Firebird. The Greenwood more closely resembled a Chrysler Fifth Avenue. The Deluxo more closely resembled a DeLorean DMC-12. The VCPD Cruiser were originally white with red and blue stripes, similar to early Miami police cars. Along with the Taxi, it had a different, badged front grille. This made it more closely resemble a Ford LTD. The Sentinel more closely resembled a BMW 7 Series rather than the BMW 5 Series. It's design was later reused in GTA Vice City Stories. The Washington originally had different frontal styling. The Freeway had a different paintjob. The Faggio's headlight was round in early screenshots. The Regina's taillights were originally metal rimmed and had a reverse lamp. This made it more closely resemble a Chevrolet Caprice Station Wagon. Vehicles that uses the "offroad" and "alloy" type wheel models had used GTA III's "alloy" type wheel model, like the Rancher, the Walton, the Admiral, the Blista Compact, and the Sentinel XS. 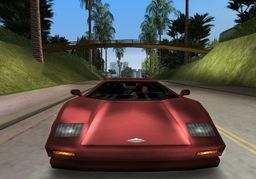 Vehicles that uses the "sport" wheel model were using GTA III's "sport" wheel model at first, then transitioned into a different style model, before settling on the final design. Many vehicles kept its model from GTA III, including the Patriot and Cabbie. The Oceanic had a one-tone paintjob. The rotor blades of helicopters carried the design from GTA III. The pre-release HUD of GTA Vice City. The pre-release screenshot of the Haitians gang. Note the shirts of the baseball cap wearing members. Pre-release screenshot of the mobile ports of GTA Vice City. The HUD of GTA Vice City was coloured differently. On the iOS and Android ports, the ammo count readout had the same colour as with the weapon icons, and the radio station text was written in ALL CAPS. This was most likely changed to improve readability especially on smaller screens. 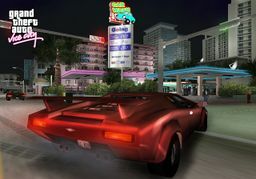 The same HUD appears in the iTunes App Store and Google Play Store screenshots for GTA Vice City, as well as whenever the player customizes the locations of the in-game buttons, HUD, radar, etc. Also, the weapon icons have been either recycled from GTA III (e.g. Pistol, Sniper Rifle) or remade entirely (e.g. M4, M60). 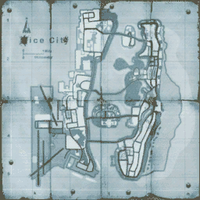 Additionally, the Uz-I originally used a pink-and-blue-colored version of GTA III's Micro Uzi icon. The Uz-I has since received a new weapon icon of its own, more akin to the original version while adapting the new GTA III-style weapon icon shape. The Fist icon from the PC/PS2/Xbox/PSN/Xbox 360 versions of the game can still be found in the HUD data on the iOS and Android versions of the game. There were many phone conversations between Tommy and Mercedes Cortez. There were many lines cut from characters such as Kent Paul, Umberto Robina, Mercedes Cortez, Mr. Moffat, and BJ Smith in Sunshine Autos. There is a reference to an additional outfit called "MC Tommy", but no model or texture of that outfit exists. 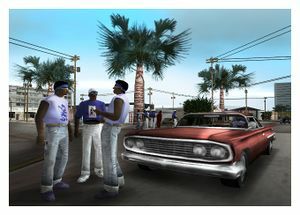 The baseball cap wearing Haitian gangster who wears the blue shirt used to have featured an ironed-on depiction of the infamous "I Want YOU for the U.S. Army" poster on his shirt during development of GTA Vice City before the game's developer settled on using a plain white "RELAX" text instead. There are unused radar icons for all the radio stations and including Vice City News. Their purpose is unknown. A Gamecube version was going to be made, but was scrapped. ↑ text\american.gxt>MAIN>MOB13_B>Mr. Moffat? How's family life? ↑ 8.0 8.1 Grand Theft Auto: Vice City Hidden Text FAQ. Robert Allen Rusk. ↑ Page 13 of the Grand Theft Auto: Vice City Manual, "Street Racing". ↑ Page 5 of the Grand Theft Auto: Vice City Manual, "Population and People". This page was last modified on 17 May 2015, at 17:50.